I picked up my daughter from school on Thursday. Once she was settled in the car I asked, "What would be the coolest way to celebrate Denise Fleming's birthday?" She initially shrugged her shoulders, but then answered, "I don't know, pulp painting." I replied, "That is a great idea. But, how about going to meet her?" It took a few seconds to register and then she said with a fist pump, "That would be awesome!" 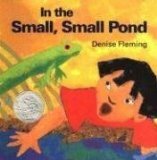 The Cleveland Public Library first hosted Denise Fleming, the 1994 Caldecott Honor Recipient for In a Small, Small Pond, on January 8, 2011 at the West Park Branch Library. She read many of her books and instructed a group of children in the art of pulp painting. Pulp painting (click here to watch a video demonstration) is described on her website as an art technique that uses "cotton rag that has been beaten to a fine pulp and suspended in water. Then chemicals and pigments are added." The pulp becomes her paint and "cups and squeeze bottles are used instead of brushes." 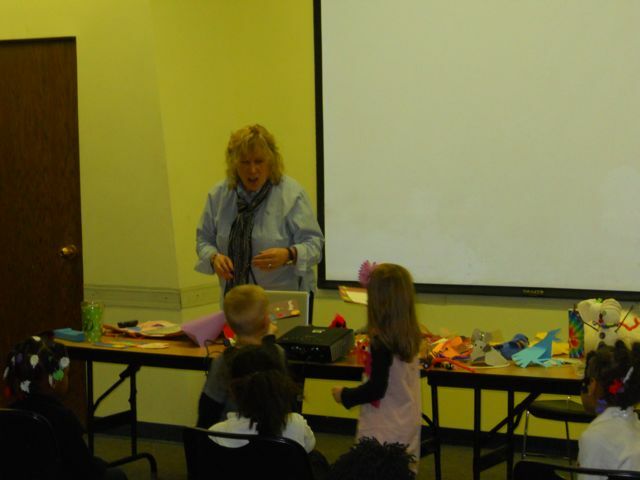 Denise Fleming returned to Cleveland the week of January 24, 2011 to visit additional library branches. Before our visit, to the Mount Pleasant Branch on Thursday, January 27, 2011, my son and daughter made birthday cards for her with their best stickers and fancy writing. At the beginning of the program in Cleveland, Denise Fleming discussed many of her books during a prepared slideshow. This allowed us to learn many new things, including that Mouse in the book Lunch is very much like Denise Fleming herself because "she loves food and is a bit of a slob." Mouse is also in one of my favorite alphabet books of all time, Alphabet Under Construction . In this book, Mouse uses power tools and lots of other fun materials. She told the group that she has loved using tools ever since she was a little girl working with her father who spent his free time building furniture! Next, she demonstrated some of the crafts that are available on her Activities page of her website. 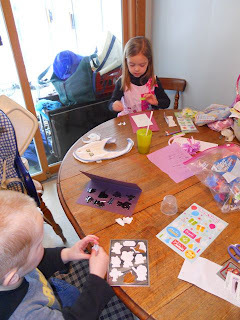 (My daughter loved the book Mama Cat Has Three Kittens and at home was able to make a Mama Cat Mask!) She concluded the program by leading the group of children in movements to accompany the reading of In the Tall Tall Grass. My daughter loved this part! When the program was finished my children wished Denise "Happy Birthday" with the cards they made. My son had his Lunch book signed and she even drew him a picture of a half-eaten apple. 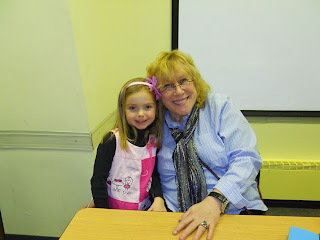 My daughter was so excited to meet her first author! 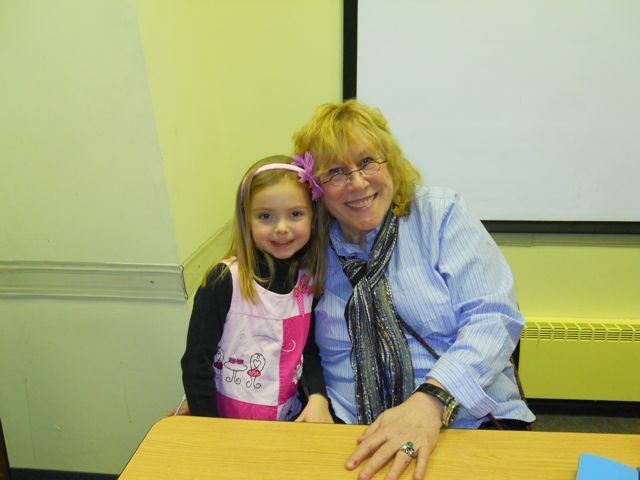 Denise took the time to sign books for all the kids in attendance, even the little ones! We had such a fabulous time with Denise Fleming that we were inspired to try pulp painting ourselves. I researched on the internet for best way to pulp paint at home. There were so many different ideas that I was a little overwhelmed. 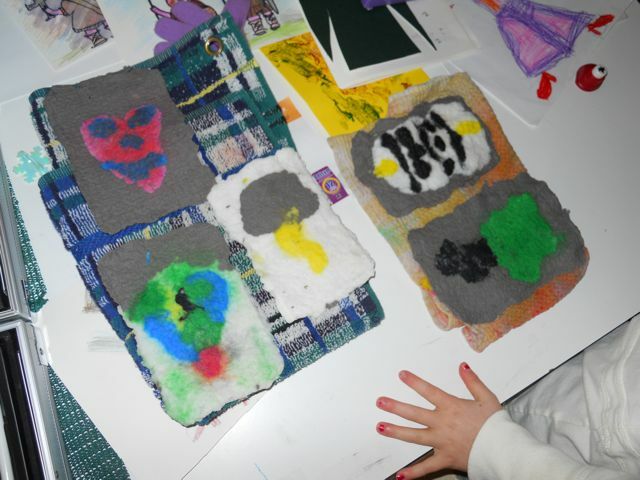 There was even a video on No-Blender pulp painting (but we didn't have no-bleed tissue paper to do this technique). We opted to do it our own way based in part upon our experience listening to Denise Fleming on Thursday. I had just clipped coupons so we chopped up the leftovers in the blender with water to make our pulp background. 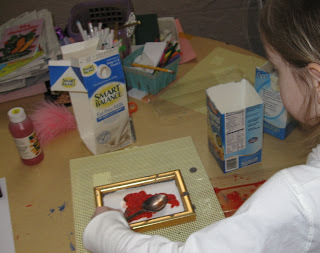 My daughter spooned it out of the container to make an even layer within the picture frame. She made a heart stencil out of cardboard which we placed over the grey pulp. The colored pulp was added inside the stencil directly on top of the grey background pulp. 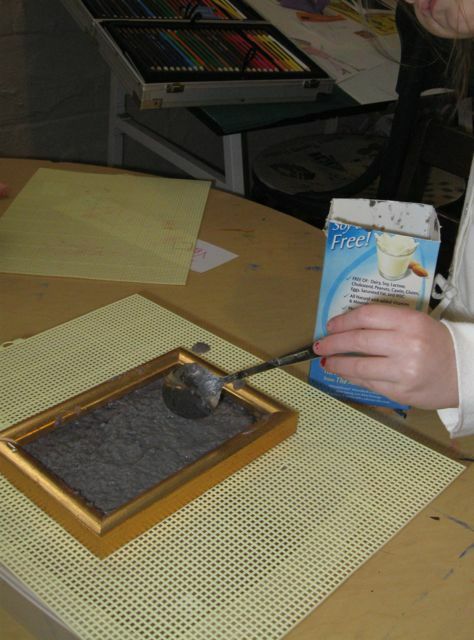 Next, the stencil and frame were removed from the pulp. We touched up the artwork with a spoon. We flipped transfered the pulp to a towel and pushed out as much water as possible. It took a few days for it to dry completely. Our pulp paintings were a smiley face heart, lightning, Clone Trooper, tree, and another multi-colored heart. Note: Using the paint did cause some color bleeding, but it worked for our low budget pulp painting! As for birthdays I can't remember a particular one as they all were fun. My family was big on birthday parties. I do get a kick out of looking at old photos of my parties and seeing how times have changed. There are many photos of my 5th birthday. It was outdoors at a small child's table. There were four kids. I was the only girl in the neighborhood at the time so my three guests were boys. Now, this is how times have changed - the boys are ALL wearing suits and ties. Yep, quite the GQ group. I am in a very frilly dress with many petticoats. The skirt sticks almost straight out. Really, we all look so lovely, not a hair out of place and on our best manners. How cool! She is one of my favorite authors and I absolutely love her website. Wow! That is an awesome birthday celebration! How exciting! We took our oldest son to meet Julie Andrews when she was touring to promote her poetry anthology last year. It was very cool. We haven't done any other authors for him yet, I'm thinking as he gets older definitely. 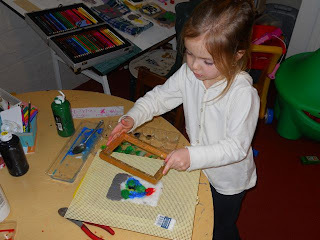 I love the idea of pulp painting...just have to come to terms with getting messy! :) Thanks for sharing! Thanks for commenting. It wasn’t as messy as I thought it was going to be, but we kept it simple. 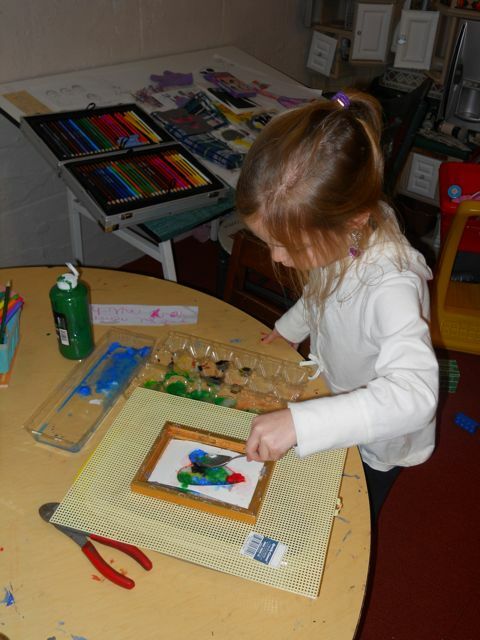 It did make us wish we had a nice art studio to really have a lot of fun!